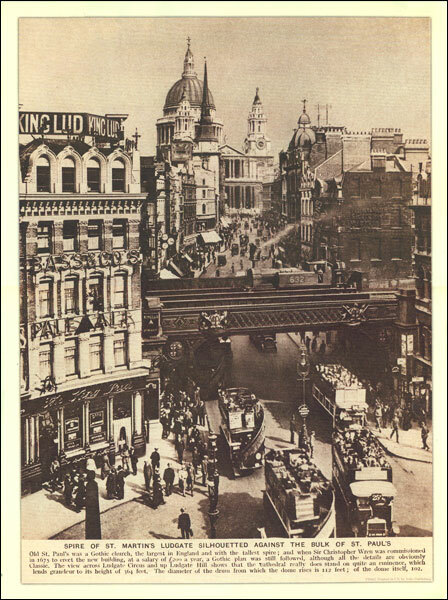 “Spire of St. Marin’s Ludgate silhouetted against the bulk of St. Paul’s” in a series of prints of sepia photos of some of old London’s best loved landmarks, presented by Soho Publishing in an A3 (29.6 x 39.6 cm) format. Under the photo are brief notes about the area. Ideal for framing, these reproductions show many long gone or much changed sites and offer a unique way of decorating your home or office with photos of near by or close-to-your-heart parts of the capital. Please note: the prints are supplied flat rather than rolled, with an A3 protective piece of cardboard, so the package will be larger than the standard size letterbox. Size: 29.6 x 39.6 cm / approx. 11.5" x 15.5"